Please note that the move has been completed! 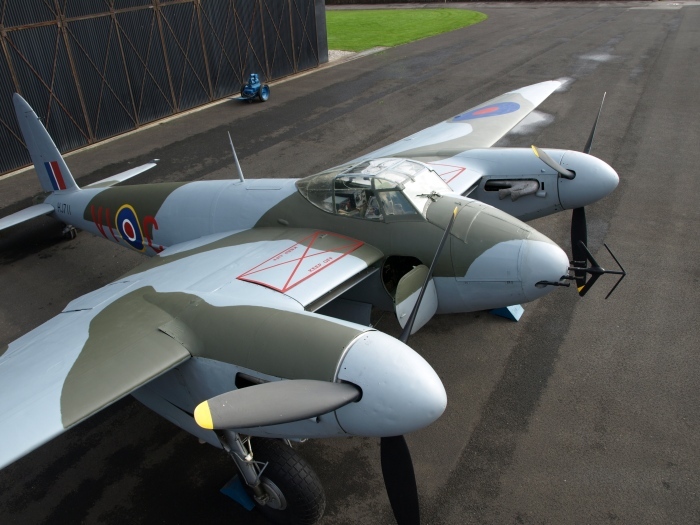 Following many years residence at its current home of the Yorkshire Air Museum, Elvington, Tony Agar plans to move his de Havilland Mosquito NF.II HJ711 to a new home at the Lincolnshire Aviation Heritage Centre. The move will be taking place by November, and planning for the move is already underway. Information on the move, including, for those who would like to be present to welcome HJ711 to her new home, when it will take place will be found on the HJ711 Facebook group at https://www.facebook.com/groups/Mossiehj711 on the Mossie.org website at http://www.mossie.org/HJ711 or on the Lincolnshire Aviation Heritage Centre website at http://www.lincsaviation.co.uk closer to the move date. Speaking recently, Tony expressed excitement at the new home for HJ711 and the additional facilities that will be available allowing him to complete work to enable HJ711's engines to be run for the first time in over 70 years. Anyone wishing to donate to help with the costs of the move, please contact either Elaine Wilcox via the Facebook group, Andy Dawson via the Mossie.org website, or the Lincolnshire Aviation Heritage Centre. Edit: Tony, Elaine and I have created a JustGiving page at https://www.justgiving.com/crowdfunding/help-tony-agar-move-hj711 for anyone wishing to make a donation to the move. Owned by Tony Agar and based at the Yorkshire Air Museum since the mid 1980's, this is a truly fascinating restoration of a de Havilland Mosquito NF.11. The restoration is also unique as it's the only existing version of this variant in the world. After nearly 40 years, the restoration has become Tony's life work. Tony has truly created something very rare and exceptional, all without any financial backing. It's difficult to comprehend the amazing lengths to which he has gone to over the years to find and obtain so many essential elements. Scrap yards, crash sites, disused airfields, industrial warehouses and with the generosity of many aviation enthusiasts and friends, parts have been obtained from Canada, America, New Zealand and Australia. All combined to provide the vast array of parts. Even the most ardent aviation enthusiast will be amazed at the great resourcefulness, single minded determination shown by Tony throughout this restoration, overcoming personal tragedy, almost impossible logistical problems, scrimping, saving, scrounging, bartering, rummaging and working very long hours and sometimes in very discouraging conditions.